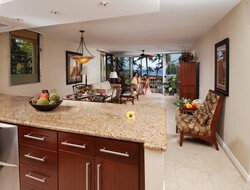 The Aston Maui Kaanapali Villas offers hotel rooms and condo rentals in Maui on the world class Kaanapali Beach! This 3-star property is located on 11 beautifully landscaped acres, and conveniently located near world class snorkeling at Black Rock, and shopping at Whaler's Village. There are 260 rooms to choose from, spread out among 5 buildings: the 6-story Aloha Tower; four 2-story buildings known as the Banyan, Coconut, Emerald and Dolphin Buildings. 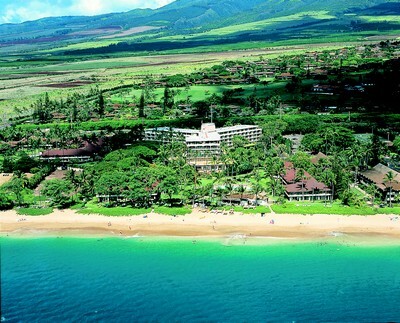 The Dolphin and Emerald buildings are located the closest to Kaanapali Beach, while the other 3 buildings are in front of a large green space. 520 avg. sq.ft. 540 avg. sq.ft. (oceanside) 920 avg.sq.ft. 1750 avg. sq.ft. At the time of this writing, there is a $13 per night facilities fee that covers parking, local phone calls, Wi-Fi, use of the fitness center, and discounts at their day spa. Since most of the condo rentals in Maui do not have their own restaurant on-site, it's worth mentioning that the Aston Maui Kaanapali Villas DO have their very own dining spot: The Castaway Cafe! At the Castaway Cafe you'll be surrounded by palm and sea grape trees as you enjoy beautiful views of the Pacific, as well as the islands of Molokai and Lanai. This casual restaurant serves island-inspired American cuisine daily for breakfast, lunch, and dinner. When you get there, be sure to ask about their specials, such as 2-for-1 pasta night! There are plenty of amenities available here to make your stay as enjoyable as possible: For fun and relaxation, there are 2 swimming pools, 2 jet spas, a and a day spa! 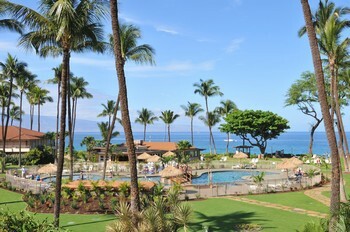 Kids will have a blast at Camp Kaanapali, along with the swimming pool especially for them! (ask about the FREE beach ball when you check in!) They also have shuffleboard if you like to play games. Mahalo to the Aston Maui for providing me with the above photos to share with you! Find out more about where to stay and things to do in Kaanapali, Maui!